Goldair Handling is operating its own Cargo Terminal on a 24-hour basis at Athens International Airport since the opening of the airport (2001). The 6,000 m2 Terminal, ideally located for fast and seamless handling of any type of freight or mail, according to the international standards. Dedicated production lines have been installed for Courier Freight. 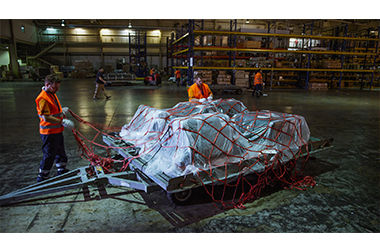 Our Team of qualified personnel is capable of handling any freight type, with remarkable servicing level results and for any type of aircraft. We currently do not have any openings for Cargo & Mail Transportation & Warehouse. If you join our Talent Network, we will email you as soon as similar jobs become available.